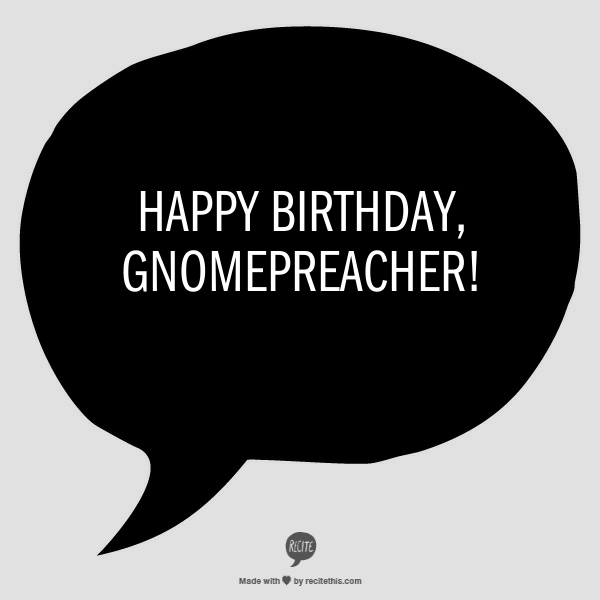 gnomepreacher is 4! | there's no place like gnome. Four years ago, on this very day, I wrote my first post. [Click on the archives tab at the top right if you want that blast from the past.] It was about moving to Dawson for internship. Can it really be four years ago already? Obviously, as I’m nearly 1,000 posts in, gnomepreacher still gives me joy and an outlet, both creative and sometimes [okay, quite often] emotional. It brings me joy that you read it too. So many of you are so kind to send emails, post comments, and let me know that you enjoy reading. Thank you for that. How will I celebrate, you wonder. Well, I’m about to eat some cantaloupe. I’ll probably read … quilt a little. But mostly I’m celebrating by writing this post. Happy 4th birthday, gnomepreacher! You’re my sanity blog and my fun place to tell stories. I think I’ll keep you around for another four. Keep posting!!! I enjoy your stories and keeping up with what is happening in your life.